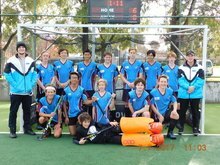 Peel Hockey are calling for junior players to create representative teams to participate in Hockey WA’s Club Championships held during the July School holidays at Perth Hockey Stadium and another venue. Club Championships bring teams together that travel from all over the state to participate in a round robin tournament, playing a number of shorter timed games for this event. Games are played on turf. Information for each age group is located on the Carnivals page of Peel Hockey’s website www.peelhockey.com.au or click for each event as shown above.